Let’s take a look now at fish tank lights and some of the points you will need to consider before you buy them. As with most other equipment required for your fish tank, you need to look at the function aquarium lights are going to be performing. The function of aquarium lighting is determined by the contents of your fish tank. By this we mean the “living” contents like fish, plants or live coral. All of these will decide what type of lighting you will need. The size of your tank also comes into play here and will also affect your choice of lighting. Light fades in strength as it passes through water. If you have a deep fish tank then you will need stronger lighting so that it can reach the bottom. There are many types of lighting available these days, but I would suggest buying a setup that is tailored for an aquarium. These lighting systems will be named and graded to help you make your decision easier. You also wouldn’t want to put a big spot light or something like that shining on your tank. A light is also a heat source; you want a light that gives off lots of brightness and very little heat. Not following this advice could lead to your lighting interfering with your heating and may result in you needing to purchase an aquarium chiller which can be expensive. Carry on reading a bit more before you decide what category of fish tank lights you want to choose. All lights will generally be given a Kelvin rating. This rating relates to the colour output of the light and is measured in degrees Kelvin. Although Kelvin is actually a temperature reading, it doesn’t actually mean the light will get physically hot. For example, an incandescent bulb (standard light bulb) with a low Kelvin rating will give off more heat than a fluorescent bulb with a higher Kelvin rating. You will need to choose your fish tank lights with a Kelvin rating that will suite the needs of your aquarium as well as bring out the colours of your fish. Below is a simple graph of the Kelvin rating scale and where some of the standard bulbs available will fit onto it. 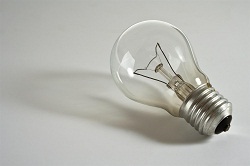 Note : Incandescent is the normal bulb with a filament that most people will use at home. Another thing to remember is that bulbs fade over time and will need replacing. This is only really a problem with planted aquariums though. Fish only aquariums will only need the lights replaced when they blow. In an aquarium that only has fish in it with no live plants or corals, then the only reason for fish tank lights is to simulate day/night conditions and to view your fish. By simulating day/night conditions for an indoor aquarium you are improving the quality of life for your fish. Your fish also need regular rest cycles just like we do and day/night cycles help with this. Some aquarists have also noted that a regular lighting cycle has greatly improved results when it comes to fish breeding. This is definitely an area to keep in mind if you are considering going into breeding fish. You will find that a low powered light setup will be sufficient for this purpose. High powered lights can look very bright and sometimes don’t give off a nice affect. A Kelvin rating between 3200K and 4500K should bring out the colours of your fish beautifully. There are other factors to take into account such as the type of lighting you have chosen, but look in the region of 1 to 2 Watts per gallon of water**. Look out for bulb ratings which are best suited for bringing out the colours of your fish and giving you a nice soft display. As far as how long to leave your lights on each day, I would suggest around 8 – 10 hours to imitate the day light hours of a normal day. This is where fish tank lights go from being an optional requirement to a necessity and a lot more time needs to be taken before you make a choice. Without going into too much scientific detail, plants need light to help them grow. Do some research on the type of plants you intend on keeping. They can determine how many Watts per gallon of water you need to provide and the Kelvin rating you should be aiming for. Planted aquariums need more light than normal fish tanks. 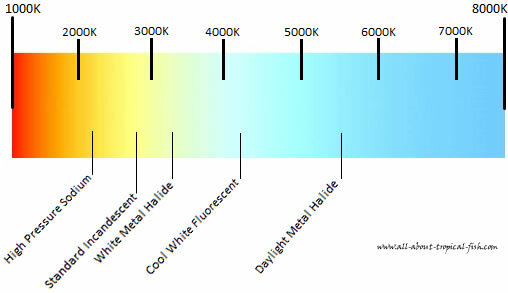 The Kelvin rating of your bulbs should be over 6000K to provide the right light for the plants to grow. Anywhere between 2 to 5 Watts per gallon is normally sufficient**, but certain plant types will thrive better at the higher power range. The depth of your fish tank will also play a major part here. Your plants will grow much better if they get even light penetration right through to their base. Some lighting setups are better designed for penetration. I would suggest that if you have a planted aquarium which is deeper than 15 inches you should look into specialised lighting. Planted aquariums generally need the lights to be left on a bit longer than fish only aquariums. Most aquarists would suggest between 10 and 12 hours of light per day, but this would be fine tuned by trial and error to suit your fish tank. Over supplying an aquarium with light has been known to cause algae problems. Keep this in mind if it is happening to you. Give yourself a helping hand and buy a timer to switch your fish tank lights on and off. It doesn’t matter whether you have a fish only or a planted aquarium, a timer will take some burden away from you. The fish will appreciate the regular cycle and you will be sure that your plants always get the light they require. A timer really proves its worth when you are away from home, or even on those weekend days when you just couldn’t be bothered to get out of bed! ** This unit of measure is pretty outdated. It is based on the output of a T12 N.O Fluorescent Light. Newer lights available these days have higher light outputs for the amounts of Watts used. You will need to take all this into account, as well as the depth of your aquarium when you purchase new fish tank lights.